Aving USA also announced that on February 29th, 2008 (yes, it’s a leap year), the Kojinsha E8 would be made available, for between 500,000 and 600,000 KRW (approximately $530 – $630 USD). This is a device that is competing with the Asus Eee PC, with the advantage of having a touchscreen and a 40GB hard drive (which comes at the higher price in comparison to the Eee PC). This is probably only going to be available in Korean markets initially (it is a Korean company). Hopefully it will make its way elsewhere (including North America). – Up to 3.5 hours of battery life. Once we have more details, we’ll post them. 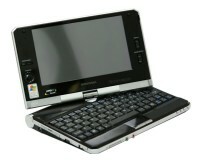 This entry was posted in Asia, Other Mfrs, Touchscreen, UMPC. Bookmark the permalink.